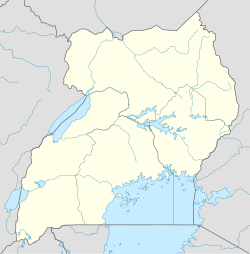 Nagojje is a town in the Buganda Region of Uganda. It is a municipality in Mukono District. Nagojje is located in a rural area, approximately 13 kilometres (8 mi), by road, north-east of Namataba (which lies along the Kampala-Jinja Highway). This is about 17 kilometres (11 mi), by road south-east of Nakifuma, where the sub-county headquarters are located. The town of Mukono, the location of the district headquarters, is located approximately 25 kilometres (16 mi), by road, southwest of Nagojje. The coordinates of Nagojje are 0°26'29.0"N, 32°53'00.0"E (Latitude:0.441389; Longitude:32.883333). Nagojje's average elevation is 1,130 metres (3,707 ft), above sea level. Nagojje is surrounded by a rural area where the main economic activity is agriculture. The main crop that is grown in the area is the cultivation of coffee. Both the Robusta and the more disease-resistant clonal variety are grown in the Nagojje neighborhood. ^ Places in the World (6 December 2018). "Nagojje is a place in the region of Central Region in Uganda". Places in the World. Retrieved 6 December 2018. ^ Geoview.info (6 December 2018). "Nagojje is a populated place and is located in Mukono District, Central Region, Uganda". Geoview.info. Retrieved 6 December 2018. ^ Globefeed.com (6 December 2018). "Distance between Namataba, Mukono District, Central Region, UGA and Nagojje, Nakifuma, Mukono, UGA". Globefeed.com. Retrieved 6 December 2018. ^ Globefeed.com (6 December 2018). "Distance between Nagojje, Nakifuma, Mukono, UGA and Nakifuma, Mukono, UGA". Globefeed.com. Retrieved 6 December 2018. ^ Globefeed.com (6 December 2018). "Distance between Mukono, UGA and Nagojje, Nakifuma, Mukono, UGA". Globefeed.com. Retrieved 6 December 2018. ^ Google (6 December 2018). "Location of Nagojje, Mukono District, Uganda" (Map). Google Maps. Google. Retrieved 6 December 2018. ^ Elevationmap.net (6 December 2018). "Elevation of Nagojje, Mukono District, Uganda". Elevationmap.net. Retrieved 6 December 2018. ^ Nuwagaba, Edwin (29 September 2010). "Farming: Nagojje abandons clonal for robusta coffee". Daily Monitor. Kampala. Retrieved 6 December 2018. This page was last edited on 7 December 2018, at 00:38 (UTC).